My oldest son will be turning 12 in a few days and honestly, it's completely surreal how fast these years have passed! This year, he has decided against a cake. Instead, he asked me to make brownies that taste like Reese's Peanut Butter Cups, While I've seen a few boxed versions around, they weren't quiet what he was looking for. He wanted big chunks of Reese's Mini's inside of the batter. and for the brownie itself to taste like a giant peanut butter cup. I couldn't leave the recipe up to chance on his big day, so I decided to do a dry-run this past week. What I came up with was a Deep Dish Peanut Butter Cup Skillet Brownie. that seriously tastes out of this world! I can't wait to make these again for him in a few days for his Birthday! Do you love Reese's Peanut Butter Cups too? 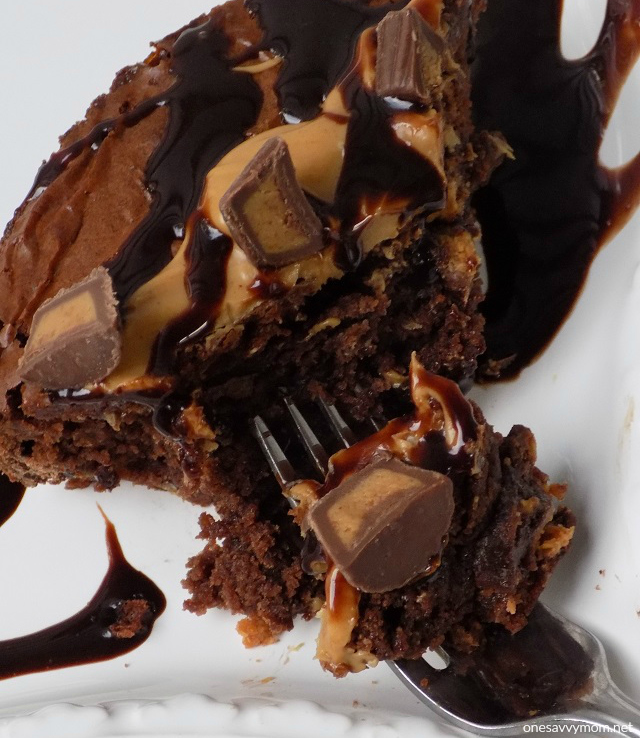 Grab my recipe below, to make your own Deep Dish Peanut Butter Cup Skillet Brownie. Preheat oven to 350 F. Melt the milk chocolate, peanut butter, vanilla extract and butter together in a double boiler - stir consistently to combine ingredients until the mixture is smooth (or in the microwave on the defrost setting at 20-30 second increments - stir in between to combine ingredients until mixture is smooth). Remove from heat and set mixture to the side. In a separate bowl, whisk two large eggs, then add in the dry ingredients. Once combined, fold in your melted chocolate. peanut butter, butter and vanilla extract mixture. Add 1 bag of Reese's Peanut Butter Cups Minis to the batter and fold gently until ingredients are combined well. Pour brownie batter in a 6" - 7" deep dish cast iron skillet, and bake at 350 F. for 35-40 minutes (until a toothpick inserted in the center comes out clean). Remove skillet from oven and allow adequate time for cooling (about an hour). Once cool, place 3 teaspoons of peanut butter in a microwave safe dish and heat on high in the microwave for 30 seconds. Pour warm peanut butter over the top of the skillet brownie; the peanut butter will thicken back to it's original consistency within a few minutes, after it's been poured over the brownie. Next, drizzle Hershey's chocolate syrup over top of the peanut butter (once the peanut butter has cooled/set). 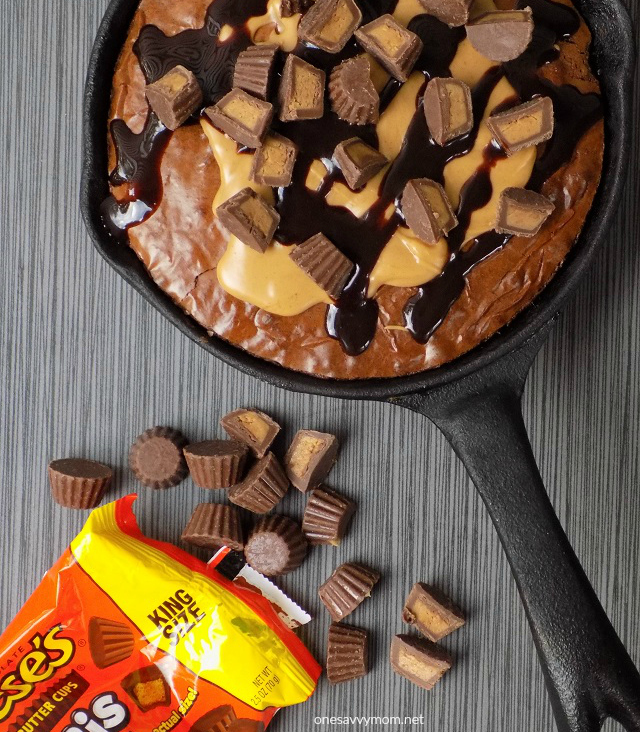 Chop the second king size bag of Reese's Peanut Butter Cups Minis in half and add them to the top of the deep dish peanut butter cup skillet brownie to complete it.